La Colombe brings European coffeehouse atmosphere to D.C. Looking for a great place to study? La Colombe's quiet atmosphere and picture-perfect cappuccinos might be for you. 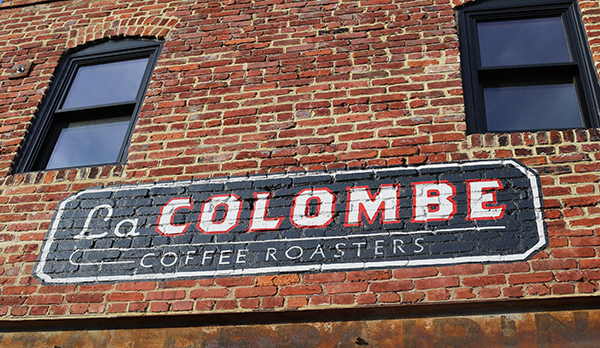 On the side of a brick building in a quiet alleyway near Mount Vernon Square, the words “La Colombe” are painted in white, red and black script. Inside is a posh café with high ceilings and steel beams, exposed brickwork and small tables ideal for enjoying a warm cappuccino. A row of aged wooden tables and low stools on the left side balances a long bar on the right. With the aroma of coffee filling the space, I decided to sit facing the wall of windows, open to Blagden Alley, after ordering a skim cappuccino and croissant. Few people walked by during my time there. There is no menu posted on the wall nor is there one available anywhere on the counter. The barista was glad to tell me La Colombe’s traditionally European offerings: drip coffees, espresso drinks, teas and more Americanized iced coffees and teas – no pumpkin spice lattes here. Presentation is important to the baristas. Made in a red and flowery ceramic mug, my cappuccino ($4) was filled to the brim with foam, separated by a Y-shape of espresso on top. The croissant ($2), which was on a matching ceramic plate, looked buttery and fluffy. The cappuccino’s dark roast coffee and light foam sharply contrasted with the bitter yet effective espresso, but the two tastes complemented each other well. Straight from the barista’s hands, it was just the right temperature for drinking. The croissant? Typical and bland. While it looked perfectly flaky and fresh, the plain croissant lacked a buttery taste. I finished the whole thing, but it tasted only slightly fresher than a pre-packaged croissant I could buy at Starbucks. The best quality of La Colombe is its ambience – unlike most chain cafés, La Colombe feels like a unique place. Since it is a long, narrow space, the furniture is compact. Each table is small and hardly has enough room for two laptops and two mugs, which makes it difficult to hold a group study session there. At the same time, the café remained pretty quiet during my visit, so solo studying is preferred. With benches outside the entrance and a bike leaning against the side of the aging building, it felt like a little-known community hub that a person might find in a quaint European village. Unlike other cafés in the D.C. area, La Colombe offers a traditional, elegant coffee bar atmosphere. At each table, patrons were writing in their leather-bound journals, gliding their fingers along their laptops’ trackpads while sipping their coffee, or enjoying a chat with a friend. Close enough to be an ideal study location but far enough to feel separate from the world of GW, La Colombe makes for a great midday trip. Come here during finals week to escape the chaos of students running around campus with open textbooks and spilling venti coffees from Gelbucks. Just don’t tell your friends. This article appeared in the October 30, 2014 issue of the Hatchet.